The government announced today that Myki will be valid on trams and buses from Sunday. Finally, Myki goes multi-modal in Melbourne! Ignore the dates — as of Sunday we’ll be at stage 1, where it’s valid on trams, trains and buses. (I guess that means all this year we’ve been at stage zero.) It’s only after that happens that they can seriously start switching people from Metcard to Myki. So next they’ll increase availability via retailers. And they’ll start switching station booking offices (line by line) and station vending machines from Metcard to Myki, and then they’ll start switching buses and trams. It’s a deliberately slow rollout, to gradually increase the number of people using the new system vs the old, and so they can deploy the Myki Mates along the way to show people how it works. So next week they may not immediately be actively pushing people to switch to Myki. As such, there’s no free Myki card offer right now, though I’d expect one in the coming months when the next push starts. So no rush to buy a card if you didn’t get one earlier when it was free. V/Line will come later. Which is fair enough; doing all remaining modes in one hit would be unwise given I’d expect some glitches, just like there were on day one of the trains. Trains are mostly running smoothly now — perhaps the biggest problem is the gates and standalone scanners have inconsistent response times. So, what’ll happen on Sunday, and on Monday? Probably not much. I expect a few extra people will use it, but most still won’t have cards. 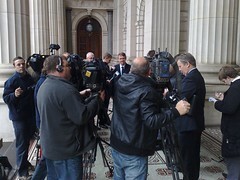 At the doorstop at lunchtime, the Opposition was claiming that inspectors can’t check Myki cards. That may have been the case until recently, but I know for a fact at least some of them are now carrying portable readers, because I encountered two of them (on two separate trains) on Saturday. They successfully checked my Myki and Jeremy’s. I asked one of them to try it from within my wallet (it works on the scanners if you’re careful) and it worked. So fare evaders shouldn’t count on free rides just because they’re carrying a Myki. Now that they’ve got rid of touch-off on trams, and assuming everything else works, I think the biggest flaw now in the design of the system, is the scanner sounds. There’s one beep if you touch-on, and the same for touch-off; two beeps each for concession. Distinguishing concession is pointless: you know what sort of ticket you have, and inspectors will use the lights on top of the gates to know who they should check for concession entitlement. Instead it should be different tones for touch-on and touch-off, so people don’t have to stop and look at the screen to make sure they’ve done the right thing. Anyway, I still don’t think it was worth the money — there were bigger priorities. But the money’s been spent now, so hopefully it’ll be smooth going from here. myki shmyki. i’ll used it when i’m forced to and not a minute sooner. To celebrate I’ve been brave and tried an online $10 topup to the Myki I got for free in the initial release and still have never used. Fingers crossed! Meanwhile, I am yet to personally see one single person get through the gates at Spencer St with a Myki card without needing to be let out/in by inspectors. Good point about the sounds Daniel. They should use something similar to when you plug in and out a usb device on your computer. Better for blind and low vision users too. Should we start taking bets for how long before it goes under and gets canned? @Ren, from the sounds of it, certain gates (IIRC at the Collins St end) have problems. I use Spencer St once or twice a week with a Myki with no problems, though usually at the Bourke St end. @Luke W, bingo! Sounds similar to a USB device plugging in/out is precisely what I’ve been thinking of. Note: Legally blind users can get a free travel pass. Good summary Daniel. And as usual you came across credible on the ABC news last night. As I live in a Zone 1/Zone 2 overlap, it remains to be seen what I’ll be charged using myki on the local bus. Too many variables involved. Any news on the touching on/off at stations where there are big crowds (such as after the footy)? 40,000 people all trying to touch on at the same time would be a nightmare!!! @daniel. Will there still be 2 hour and daily tickets and will people on zone 1 get fines if they dont touch off? My $10 came through! Who said they government couldn’t get a basic internet payment gateway working! I’ll be looking forward to using it on trams. Having used Myki almost exclusively since they were first mailed out, I’ve been perfectly satisfied. But then I’ve always paid cash with the old system and have simply continued to do so. Pleasingly, I’m yet to lose a single cent in the machines in some 6 months, and the fare deductions are invariably exactly as anticipated. This is a not inconsiderable improvement, given that I was accustomed to losing money on an almost weekly basis with Metcard machines. Plus I no longer have to stock up on the cheapest multi-trip option for the particular zone(s) I happen to be traversing. And no, I’m not receiving money from the ticketing authorities. It was not a good way to spend a billion-plus dollars, but anyone promising to scrap it at this point is inviting ridicule. @Jon, online payment was very dodgy earlier this year, but seems to have improved substantially in the last few months. @Andrew S, yeah, I think the trick is to make the scanners fast enough, and have better touch acknowledgement tones, so that people can do it at walking pace as they board. I’ve been using my myki for quite a few months now (very succesfully, I might add), and have actually used it in crowded post-footy situations… me and my partner have managed to seriously interrupt the flow of people behind us in these situations – and there’s only two of us who are quite adept at touching on/off!!! b) the turnstiles are left open at Southern Cross before and after games (which so far they seem to be; same with Richmond). To date, this has cost me the same fare I would be charged with the full-on touching on/off. @Chuggle, I’m going to guess that you’ve only tried that on a weekend. This is because your touch at Ripponlea when returning home would be treated as a touch-on, not off, as it would be too long after your original touch-on to be considered part of the same trip. On a weekday, with no touch-off, the system would assume you’d gone into zone 2, and would charge you the default fare: z1+2 for your trip in, plus another one as you exited Ripponlea (but touched-on) on the way home (unless it was after 6pm). On a weekend/public holiday, it wouldn’t matter because you’d hit the daily $3 cap, which is what you’d have paid anyway. As for legalities (if you did no other travel on that day) then on your trip home (which would be after your initial two hour fare had expired, unless it had been after 6pm) you would not be “legal”, as there would be no current fare product (to use the techo term) on the card. Also, after 6pm (on a weekend) you’d end up paying $3 rather than $2.94, as well as not being legal on the way home. I’ve seen nothing at all encouraging tram users to make use of the other validators (look around – they aren’t just in the door you walked through). Several times recently I’ve had people standing on the tram steps waving a myki furiously at the scanner, where there’s quite a number of others working perfectly. Oh, and the tourists swiping metcards is something pretty funny. Oh, and on a technical note, the scanner at the front door of trams, mainly B and Z Class, could be rotated 45 degrees – this would encourage people to step inside first as well as keep people clear of the doors. I’m a bit concerned about how well myki won’t work on buses. Much has been made of the issues of tram readers patching out in various areas of the tram network, but little has been said about the bus issues. Considering the bus network covers a far greater area of Melbourne, would it not be fair to be concerned that there may even be more unnoticed issues with touching on/off on buses once myki goes live? Still, I am looking forward to trialling it myself on all three modes. So far, apart from a few touch on/off issues at stations (mainly with the old Metcard gates), and being overcharged on Geelong buses on a few occasions, I’ve actually quite enjoyed using myki. Hooray. Gonna spend all day on trams tomorrow to celebrate :). Using it on trams in the last few weeks (yes, I’m a rebel) touch on is very fast now. The main worry of course is, will people get charged correctly? Regardless, the naysayers should really give it a try. It’s no where near as bad as you might think. No more metcards for me. And those if us coming in from zone 2, what will we get charged if we don’t touch off in the tram? @Ant, if you’re travelling ONLY in z2, you would need to touch-off to get the z2 fare. If you’ve travelled into the CBD from z2 for the day (which I know you do most days on the train?) then you’d get charged correctly on the tram if you don’t touch-off, because you’re already paying for unlimited travel in both zones anyway. So myki is going live on trams and buses on Sunday eh. Well not for Seniors. We are being discriminated against because we are old, feeble and dotty. Unable to cope with a new system in its infancy. We will not be sent our mykis until the system has ‘matured’. I take this to mean that we won’t be sent our mykis until the system is working well. If that’s the case, I believe that we will NEVER receive our mykis. I’m angry that the State Government has broken the promise that Lynne Kosky made last January 14 that there would be a further free myki card offer during the tram/bus rollout period. I know a few people who did not take up the free offer earlier this year because they only use trams or buses, so figured there was no hurry. If the myki people were going to be run off their feet filling orders during the free period, then train travellers deserved first go; why add to the chaos? Those people now feel cheated. I didn’t make use of that free offer either because I buy yearly tickets through the PTUA commuter club, and my understanding was that my Metcard would be replaced with a free myki at some stage (not necessarily on renewal), with appropriate unused credit on it. My current yearly ticket expires 30 Nov, so I’ll be ordering another ticket in October. Will I now need to fork out the extra $10? Add this latest incident to the long, long list of reasons why I am very disappointed with this government’s performance. @Bonnie, there’s an election coming, don’t be too surprised if the free offer pops up again! Commuter Club Yearlies WILL be replaced, for free, with a Myki, towards the end of the year sometime I believe. If I were you, I would just go ahead and order your new ticket; don’t bother buying a Myki. btw, the Legally blind free travel pass.has a built-in myki. So we have the option of trying to use the station gates. Otherwise we’re still stuck with trying to find the attended gate at major stations….